Souderton 3rd Fridays are back! Souderton’s Business Improvement District (BID) is proud to present 3rd Friday events once again in 2018. From April to October, visit downtown Souderton to enjoy dinner, dessert, live music, family friendly activities, and specials from local businesses and vendors. This year, 3rd Friday will cover its largest footprint so far: Main Street from Montgomery Theater to Broad Street, Chestnut Street on both sides of Main Street, and even East Broad Street. If you’ve come out to 3rd Friday in the past few years, prepare to be impressed by the expanded layout and new vendors. This year, there will be 2 food trucks, 2 live music areas, a DJ, a photo booth, and even a beer garden! Blueprint Brewing Co. will be serving their craft beer in the parking lot of 9 N. Main St. Many businesses with a Main Street storefront will be open late on Friday, and many other vendors will set up tables to display their products and services. If you’d rather have a sit down dinner, most restaurants in the borough are offering 3rd Friday specials. When you arrive downtown, be sure to get your ice cream from Downtown Scoop (under new ownership this year), or stop by the Leukemia & Lymphoma Society‘s bake sale. Exhibit B Gallery is opening a new show on Friday, featuring Rye Tippett. Stop in to meet the Bucks County artist and grab a snack. Check in at Art on the Hill and Consign for Design to find that special gift, or just the right new piece for your own home. Don’t forget to turn the corner onto East Broad street, where you can take pictures in the Classic Memories Photo Booth, warm up with a coffee at Broad Street Grind, and try to escape Play It Out‘s 5 minute teaser game. The goal of 3rd Friday is to show off all that Souderton has to offer. The BID wants to showcase Souderton’s local businesses and show residents, potential residents, and potential business owners that this is a great town for them. Visitors will enjoy a relaxed night out getting to know their neighbors and supporting local shops. The long term vision of 3rd Friday is to reach further down Main Street as new businesses enter town, and to span more of Broad Street once many of those projects develop in the coming year. When you join in the fun at 6:00 this Friday, be sure to plan for parking. The lot off of Chestnut Street can be reached from Wile, and the lot off of Main Street next to Village Center will be open. Street parking will be open on Main Street, and don’t forget about the ample parking on Front Street across from Ruth & Company. Come early to get a good spot and stroll through town as the festivities get started. Play It Out opens at 4:00 on Friday, so why not plan an escape before dinner? Souderton is most definitely on the rise. 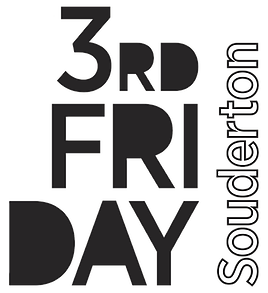 Invite your neighbors, friends, and even folks from neighboring towns to 3rd Fridays in Souderton this year, and be part of our growing community.